Unfortunately, my main computer that I make concepts on crashed. That computer has all of my work and is much easier to make concepts on than the one I'm using for now (an HP netbook). Hopefully, I'll get it fixed soon and can get back to working on this series. 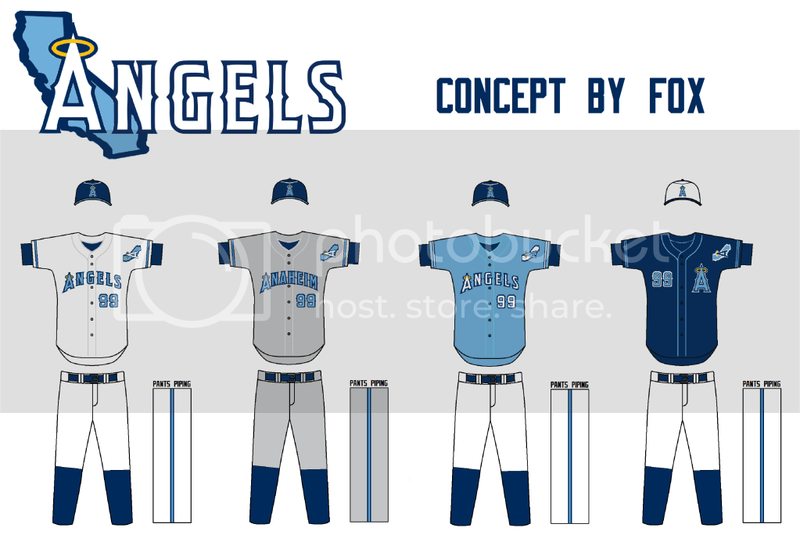 This is not really much of an update, but it seemed like a good time to formally post my Angels concept in this thread. It's already been posted in the City Multi-sport Contest and in another thread, but I'm still looking for some more C&C on it. There are some things that I would have done differently if I wasn't going to submit it in a contest, but overall it's some of my proudest work. The A in the California state outline is my favorite logo concept that I've made. While some of you have maybe seen it before, I'd love to get some C&C. Very nice. The only problems I have are that the number should be lower on the dark blue jersey and that the navy outline on California could stand to be thinner. Absolutely agree. Nice job Fox, definitely one of your better concepts. That double blue works beautifully for the Angels. I never did think of that scheme for them. You've integrated it nicely with that little hint of gold, and designed it in a way in which I didn't think "OMG RAYS LOLZ" at all (regarding the colors) - I thought "Dang, I wouldn't mind that at all for Anaheim!". Very nice work, one of your best in the series. Still having computer problems, but was able to finish off a half completed Boston Red Sox concept. Nothing earth-shattering for the Sox, despite dropping navy for dark green. I did everything I would do to their current set but with green substituting for navy. As a Red Sox fan, I have to say, this looks very odd, but I hope you guys like it. Trying to get my computer issues resolved soon! C&C Please. You certainly fixed the problems on the road uniform. I also like that you went with green. I would like this concept, but one thing just absolutely ruins this for me. That shade of "green" is atrocious. Maybe it's just my monitor(I say maybe because I have my brightness up), but that's WAYYY too dark. I think a shade similar to the Green Monster or shamrock(that's what I plan to use in my MLB Series) would suffice. That's really the only problem I have with this set. Nice job. Edit: Oh yeah, thanks for the recommendation. Normally green-red would look too Christmay, but dark green looks good without bringing that up. However, I'm not a fan of a green road hat (for the primary, not the alt). It sticks out way too much with the only other green being on the belt. If you want to keep it consistent (which I know you'll want to), make the piping green. And on a side note, the road looks 1000x better than the real because it has an outline. They really need to fix that. And thanks for the link to my series I haven't updated it in a while partly because I've been busy with family, but I've also been real lazy (i.e. I've been sleeping, eating, and playing PS3). Worked on the Nats for a long time today. It's risky, but it's some of my proudest work. Hope you like it. Really hope you guys like this one! C&C please. The sleeves are clever. I like it! The home cap reminds me of les Expos (in a good way), and the flag sleeve thing is a novel idea. Having said that, it doesn't work very well on the road grey, and is only OK on the blue. Perhaps it could serve as a home-only thing? I wouldn't mind you keeping it on the blue jersey, but they don't look good on the grey. EDIT: Oh, and on the road, the number outline should be blue to correlate with the other jersey numbers being like an inverted script. Love the originality and outside of the box thinking when it came to your Nats set! My only problem is that when I first looked at the sleeves I thought of Puerto Rico with the single star and stripes. I actually don't mind the Red Sox set. 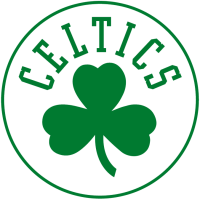 The green can represent both Fenway Park and Boston's huge Irish population. I'm also liking the Nats hat, as it's alot like the Expos old hat. I'm not crazy about the sleeve design though. Also, where did you get that template? Thanks for the recommendation, and I absolutely love those Nationals uniforms! I kinda did the same thing with an Expos-esque hat and the removal of the curly "W" on my upcoming Nationals concept, except mine doesn't have a red bill, and it's only on one of the alts (which itself is a tribute to the Expos). Good job! Also, where did you get that template? I'm pretty sure he's using a shrunken-down version of this. The creativity is amazing as usual, but there's too many flaws for me to like it. Like BigBubba said, it's doesn't really work on the road jersey. I'd outline the number on the road jersey in blue instead of white. While I'm writing this, I'm actually starting to like it. The home script looks beautiful on both home jerseys. The home jersey is just beautiful in general. Maybe it's just because it resembles another former member's concept slighly....Jahgee. Yeah, I like it. Nice job. As a Nats fan from the city this concept is dead on but it sort of bothers me. I'm getting a Texas Rangers vibe from this despite the US flag. 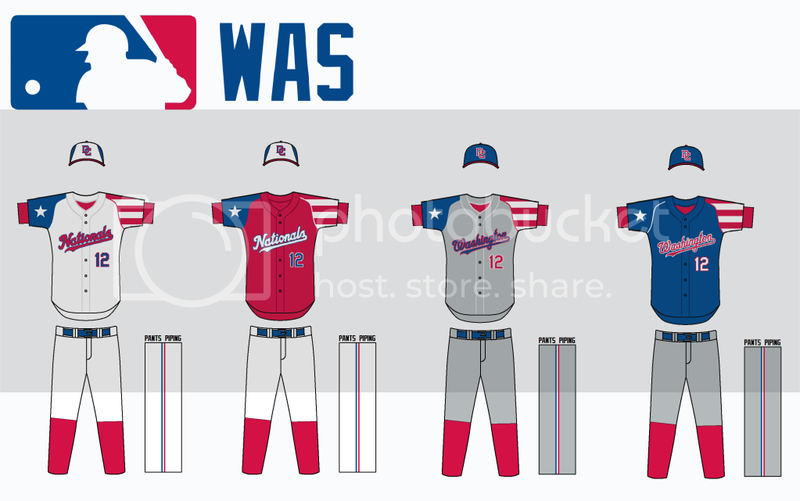 IMO it would be way better if you incorporated the actual D.C. flag and possibly add vegas gold as an accent color from our Manny Acta era set. Thanks for all of the feedback on the Nationals. Here are the Phillies. This will be my last concept before I do updates for the first half of the series. The bottom two uniforms are alternates, and they are both intended for use at home and on the road. C&C Please! This is a great set. Good job Fox. The one thing I question, though, is the use of the underline. It's just seems unnecessary to me. There's not too much wrong with having it; it's justthat it looks better with the script alone. This says most of it. I'm still not sure how I feel about the piping. It's just seems out of place. 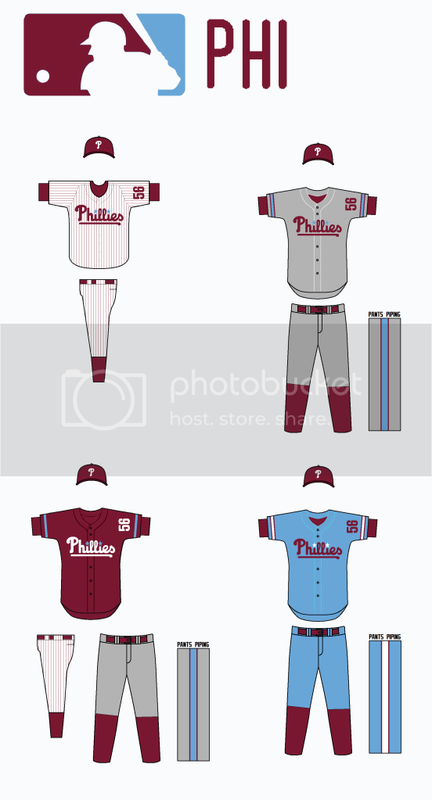 There's so much baby blue that I can't help but feel like the Phillies are a baby-blue team first and a maroon team second. The rest of the uniform is about 95% maroon while the piping is 80% baby-blue. Nice job on the Phillies. Maybe a blue belt would help.